Whether it's a brand-new-brand or an established one undergoing a transformation, I'm a pro at creating a unique brand value proposition that stands out from competitors, and executing that idea through internal strategy and external messaging. Here, our challenge was to create a campaign promoting "gifting for no reason," ie, the "just because" gifting occasion. However, we couldn't alienate our existing huge occasions of birthday and anniversary. 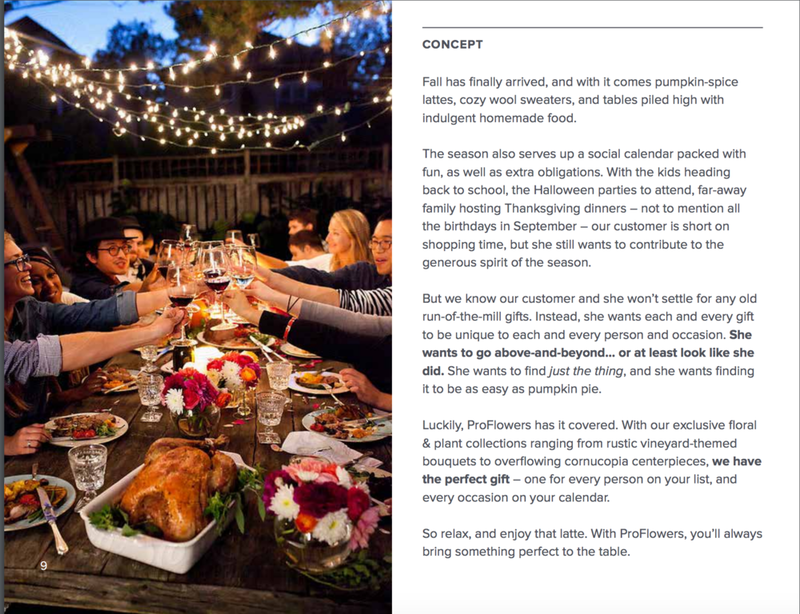 The solution: A campaign that flips the idea of "gifting for no reason" on its head: There's no such thing as a "just because" gift, because there's always a reason to celebrate. I also specialize in taking a complicated marketing challenge, distilling it down into a single unmet consumer need, and answering that need with a creative concept that easily translates into print, web, and social media. Here's an example of a ProFlowers fall campaign. CHALLENGE: Make flowers a relevant gift at a time of year when they currently aren't top-of-mind. UNMET NEED: The customer wants to look like he's got all his bases covered. He has a strong desire to show up prepared, with the perfect gift for every person, and to make a great impression at all of the fall season's festivities. SOLUTION: Position ProFlowers' exclusive collections and wide assortment of different aesthetics as the perfect solution for all our customer's fall occasions. CONCEPT: "Bring something perfect to the table." Sometimes, direct response is king. There's just no way around it. That's why I make sure to infuse creative copy & strategic choices without compromising the click. A brand's website is its home. Even if the brand spends most of its time chatting on social media, or persuading from a billboard, or entertaining on TV, at the end of the day its website is where it lives. And a lot of the time, the website is also where the transacting happens. That's why it's important to blend strong brand language with a clear call-to-action. Click image to view entire homepage. One of my favorite ways to delight an audience with brand-rich copy is to meet them where they are - in real life. In a store, on the sidewalk, along the highway. It's a reminder that there actually is still a world of wonder & humor out there beyond the screen. Spec campaign for The Weather Channel. Weather symbols are used out of their ordinary context, and in real-life situations - like a crowded subway train. This aisle violater for Dutchboy was used in Home Depot. 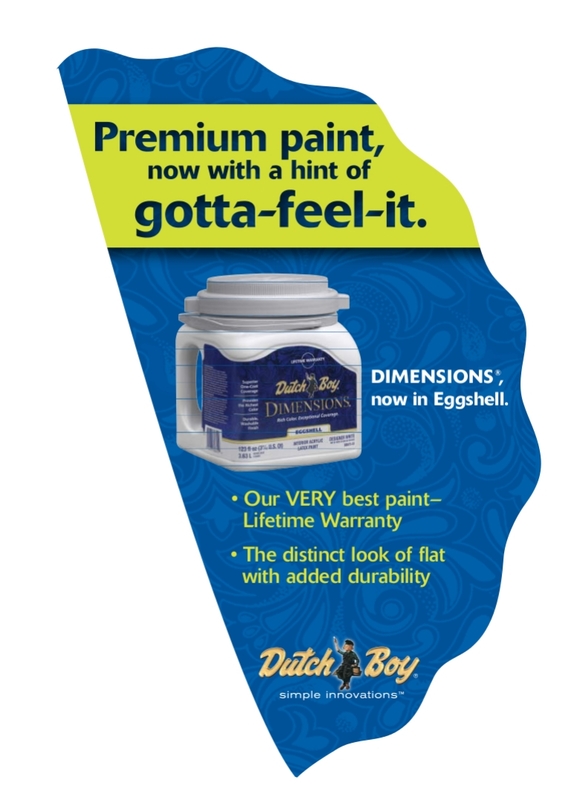 The brand new paint line went beyond the shade to pack dent-resistance, fragrance, and texture. This Addy Award-winning campaign for Stainmaster utilized a clear glass bus, models, and a bed featuring new stain-resistant fabric. The models would eat chocolate, drink wine, and play with puppies on the pristine (washable) white bedding as the bus drove through NYC. Nothing delights a customer like opening a box and hearing a little voice cheering for them as they explore what's inside. Instead of giving the spa set for ProFlowers ambiguous floral names, we used actions like "relax" and "indulge" that would explain to the recipient how to use them, but also make them feel pampered. Carrying on the theme of naming gifts after actions, I chose to name the ProFlowers chocolates "Savor." The elegant design is juxtapositioned with fun flavor descriptions - click the image to read them. This gift is a whopper - a bouquet of flowers paired with sweet dipped berries or truffle treats. As the recipient opens the gift, they're met with fun lines such as "Don't be shy - dig in" and "sharing is optional." Facebook, Pinterest and Instagram are places where a brand's voice can really run wild, and where the brand story (beyond the product or service) can be told. And it's a heck of a lot of fun to write. Video can tell a story and immerse the viewer in a way that no other medium can. Of course, that presents its own challenges. Quick, conversational copy and a strict adherence to the rule "either show or tell - never both" are necessities. Click the thumbnail below to play a video shared on social media & site. want to see more? need something specific? Email me below and i'll get back to you in a jiffy.